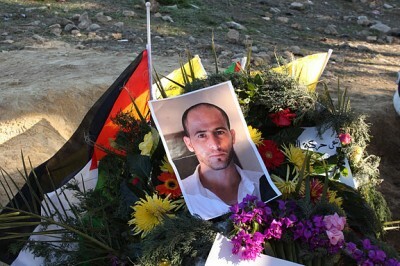 Over two thousand people attended the funeral of Mustafa Tamimi in Nabi Saleh today. Tamimi was killed during a protest in Nabi Saleh on Friday after he was struck in the face by a tear gas canister fired at close range by the Israeli military. He was 28 years old. At least six people were arrested and several people were injured as the Israeli military reacted violently to protests following the funeral. Despite the nature of Tamimi’s death, the Israeli military continued the practice of firing tear gas canisters directly at protesters. Although it is permissible to fire tear gas canisters in an arc to disperse demonstrations, it is forbidden to use them as weapons by firing them directly at protesters. At least seven people were treated by the Red Crescent paramedics and one protester was taken to hospital after suffering from severe tear gas inhalation and respiratory problems. One protester sustained a wound to the head, which paramedics suggested came from being struck by a tear gas canister. Over 100 people gathered at the hospital in Ramallah this morning from 9am. Just before 10am, Tamimi’s body, wrapped in a Palestinian flag, was carried from the hospital through central Ramallah. The crowd chanted slogans and waved Palestinian flags as they carried his body – some held up posters showing a photograph of Tamimi’s bloodied face; his orbital lobe was smashed where the tear gas canister hit his right eye. Tamimi’s body was then taken in an ambulance to Nabi Saleh, the village 20km north of Ramallah where he lived. A long procession of cars and taxis followed as people joined from Ramallah for the ceremony. Upon reaching Nabi Saleh, mourners gathered and walked up the main road leading to the mosque in the village. The approach was strewn with spent tear gas canisters from previous demonstrations. Tamimi’s body was taken to the family’s house and then to the village’s mosque at around 11:30. The village’s mosque was packed and people performed the noon prayer, followed by the Janazah prayer, customary after a death. Tamimi was then carried to the village’s cemetery where he was buried as mourners chanted and made speeches. Bouquets of flowers and tributes were laid over his grave. As the funeral drew to a close, hundreds of demonstrators headed out of the village to protest against the killing, where they were met by several military vehicles and dozens of Israeli soldiers. The military fired tear gas canisters and deployed a foul-smelling water cannon at protesters, some of whom threw stones in response. 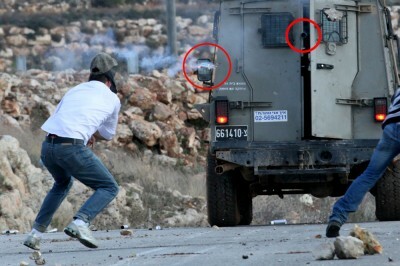 The military fired tear gas canisters directly into houses and gardens lining the road at the entrance to the village. 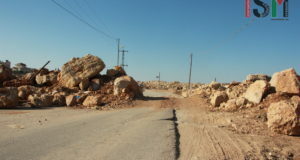 Several protesters headed out of the village down the slopes towards the Ein al-Qaws spring, which is the focus of the weekly protests in the village. The spring and surrounding area was taken over by residents of Halamish, a nearby illegal Israeli settlement, in 2009. 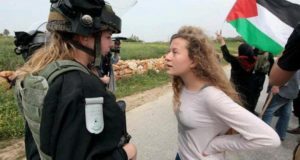 Hundreds of protesters have been injured in Nabi Saleh but Tamimi was the first fatality during the demonstrations in the village. 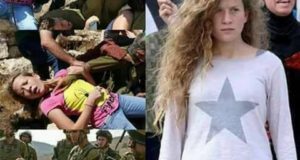 Tamimi was the twentieth person to be killed at similarWest Bankdemonstrations over the past eight years, according to the Israeli human rights group B’Tselem. The protesters confronted Israeli military personnel on the road, demanding to know “who killed Mustafa?”. The military responded to the peaceful demonstration by violently shoving, choking and kicking Palestinian and international protesters. Soldiers dragged one protester across the road by his neck and crushed another’s head into the ground with his arm. One soldier grabbed a poster of Tamimi and tore it up. They detonated sound bombs in the middle of crowds of protesters, the explosions causing ringing in the ears. They also fired tear gas canisters directly into crowds of protesters. At least two international protesters were arrested, including a member of ISM, and four Israeli peace activists were arrested. They are currently being held at Abu Dis station, near Ramallah. No Palestinians were arrested. The Israeli military violently shoved a number of press photographers who were attempting to cover the protest. Bornat was not surprised at the actions of the Israeli military – “The occupation maintains itself through killing” he said. Alistair George is a volunteer with International Solidarity Movement (name has been changed).